Every year, millions of monarch butterflies set out on an epic journey. But how do they find their way? Watch this film to find out! These wings may look delicate, but they’re powerful enough to take the monarch butterfly on one of nature’s most impressive journeys. 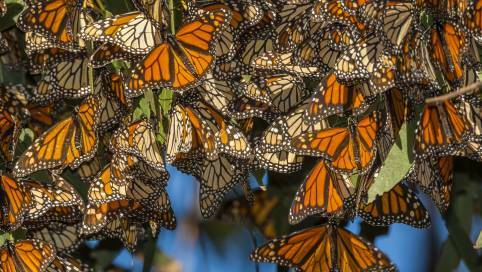 Every autumn, millions of monarchs begin their annual migration. They fly an incredible distance, from Canada and the United States… all the way to Mexico. No other butterfly species travels such a long way – but monarchs have no choice. Winters in the north are cold enough to kill them, so the butterflies must travel south to Mexico, where the winters are warmer. But they still spend many months huddled together. Then, spring arrives… and they get ready to fly all the way back again! But how do they know the way, without a map or sat nav? The answer is right above their heads! Every morning, no matter where you are on Earth, the Sun rises in the east. And every night, it sets in the west. So if you face the Sun in the morning, you know you’re looking east. And if you face the Sun at the end of the day, you know you’re looking west. Once you know east and west, north and south are easy to work out. So, as long as you know what time it is, you can use the Sun’s position like a compass. So they can use the Sun to keep them pointed in the right direction. But what's really amazing is that each butterfly is making this migration for the first time! No individual butterfly ever completes the whole journey, because it takes many months and each butterfly only lives for a few weeks. So, one group of butterflies sets off, then, when they die, their young take over. It’s like passing the baton in a relay race. A round-trip takes up to five generations – so the butterflies that arrive back are actually the great-great-grandchildren of the ones that left! This means that monarchs can’t memorise the route, or learn it from their parents. Instead, they have to automatically know where to go, and when to go there. This kind of built-in behaviour is called an instinct. And when next winter approaches, that instinct will send them on this incredible journey… all over again! Monarch butterflies migrate long distances. Monarch butterflies migrate from North America to Mexico every autumn, so that they can spend the winter in a warmer climate. The monarch butterflies use the position of the Sun to navigate. Monarch butterflies only live for a few weeks, so each individual only completes a small part of the whole migration. Show the visual before the film and ask the students where they think the animals are going, and discuss the reasons why animals migrate. Show the visual before or after the film to spark a discussion about the stages (egg, caterpillar, chrysalis, adult butterfly) of a butterfly life cycle. The movement of people or animals from one area to another. Show the visual after the film to reinforce key scientific language. What is migration? Why do animals migrate? Can you give any examples of animals that migrate? 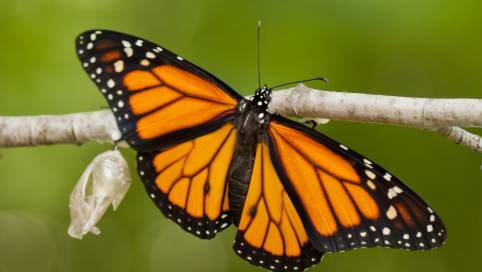 Why do monarch butterflies migrate? How long does a round trip take? How many generations does it take to complete this journey? How do monarch butterflies know which direction to fly? How do monarch butterflies know where they are going? What are the four points of a compass? In which direction does the Sun rise? In which direction does the Sun set? What do you know about the butterfly life cycle? How do butterflies reproduce? How is this similar and different to other animals? RESEARCH the monarch butterfly and produce a fact sheet that includes information about its life cycle and annual migration. WRITE a piece of text comparing the monarch butterfly migration to another animal migration, describing how the migrations are similar and different, the reasons why each animal migrates, and the distances they travel. MAKE a butterfly feeder out of a sponge dipped in sugar solution to encourage wildlife into the school grounds, and observe and record how many butterflies visit. OBSERVE a butterfly life cycle by looking after live caterpillars in the classroom, watching as they grow, spin chrysalises, and then emerge as adult butterflies. This activity develops the students’ scientific communication skills and promotes research-based learning, by tasking them with using online resources to explore and gather information about the monarch butterfly. Tell the students that they are going to research the monarch butterfly and create a fact sheet. The fact sheet will cover a wide variety of information, including the butterfly’s life cycle and annual migration. What do monarch butterflies look like? Why do they migrate? What is the migratory journey? How long does it take? How do they reproduce? What are the different stages of their life cycle? Could you find out any fun/weird/interesting facts? Migration: The movement of people or animals from one area to another. Life cycle: The stages in the life of a living thing, from birth to death. Instinct: An in-built behaviour in animals. Larva: The young of an animal that undergoes metamorphosis to become an adult. Chrysalis: The stage in a butterfly or moth life cycle between its larval and adult forms. Chrysalises have a hard casing to protect the insect during metamorphosis. Show the resources to the class and tell them that they can use any of these to make their fact sheet. For example, they could make a model life cycle using a paper plate and paint, or make a model butterfly using pipe cleaners and tissue paper, or print out a map and draw on the butterfly’s migration route. Ask the students to work in pairs to first carry out research and then create their fact sheet. Ask the pairs to present their work to the class and highlight the key features and information. The students can discuss which fact sheets are the most informative and use images and scientific terminology most effectively. Migration is the movement of people or animals from one area to another. Animals migrate for a number of reasons, including to breed, to find food, or because the weather is too hot or cold at certain times of the year. Some animals migrate fairly short distances, while others travel thousands of kilometres. It is thought that different animals use a variety of methods to navigate over long distances, such as using the position of the Sun and stars, or detecting differences in the Earth’s magnetic field. Each year, millions of monarch butterflies migrate over long distances, leaving North America for Mexico during late summer or autumn and then flying back again the following spring. The average lifespan of a monarch butterfly is four weeks, which means that the complete migration pattern (there and back) happens over multiple generations. All living things go through stages of development. Together, these stages are called a life cycle. While the offspring of some organisms are smaller, less developed versions of the adult form, other organisms undergo a change called metamorphosis – for example, butterflies, frogs and ladybirds. Some life cycles are very short, lasting only a matter of days or weeks. Other life cycles, such as the oak tree’s, can run for decades or hundreds of years. The stages in the life of a living thing, from birth to death. An in-built behaviour in animals. A period of the year (spring, summer, autumn or winter) that is marked by particular weather patterns and daylight hours.